A friend and I were talking about how technology companies can be stressful when the old Landrover came to mind. 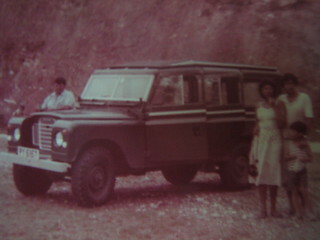 When I was a kid, my father and his younger brother took both of their wives – and me – down to Trinidad and Tobago and drove the old family Landrover around with me in the back. Now, in the back of that model of Landrover, the brilliantly dull engineers that designed it had placed the rear axle and rear seats strategically such that there was no comfortable way to sit. Further, the roads in Trinidad and Tobago, even to this day, are not designed for a glorified internal combustion chariot with no suspension. And at some point, as my late Uncle said, I mumbled from the back… “Switch drivers!” They laughed. I grumbled from the rear. Sometimes that’s what it seems like when you work at a technology company. It’s tough enough to contend with so much competition in the industries of technology, and then to predict where you’re going to be has dependencies on whatever technologies you build on. And it’s like building a house of cards in the back seat of a Landrover. Cost of the industry. But sometimes you still want to shout, “Switch drivers”. And sometimes you should. Sometimes the company needs to understand that if the goal is to deliver quality in the back seat of a Landrover, you don’t have it bouncing around. Find ways to make the ride smoother. Next > Why Windows 10 Means Linux for Me.